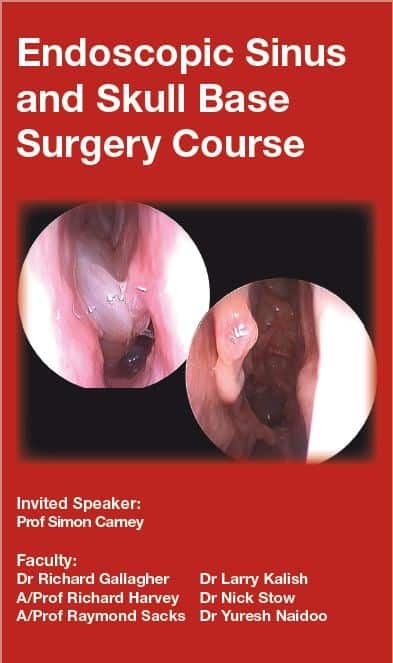 The Endoscopic Sinus and Skull Base Course takes place in conjunction with the Rhinoscopy Workshop in the 3rd week of August. Please contact Margi Griffiths for an application form or this year’s course details. The course is aimed at practising surgeons and registrars. Advanced areas of surgical management are covered. There is a focus on integrated medical and surgical management. Modern concepts of airway disease, inflammatory processes, and an evidence-based approach are discussed. Live surgery is planned on Friday morning. Lectures and discussion prepare the participants for two afternoons in the dissection laboratory. For more information the 2011 registration brochure can be downloaded. The registration brochure for this year can be obtained from Margi Griffiths.